Trace requests through your entire application and infrastructure, across RPC calls, through queues, and more. Go beyond simple averages with precise metrics and traces to solve tough problems quickly. Monitor applications across many different programming languages: Go, Java, .NET, PHP, Python, Ruby, Node.js and Scala are available now. Fast on-boarding process. Get unbeatable value with a low cost per host, billable host count based on host hours, and the ability to blend APM and infrastructure host pricing within a single account. AppOptics ties together the path of an entire request into a trace, so even as you add internal services or APIs, you’ll know the link between deep-down bottlenecks and user impact. AppOptics goes beyond simple averages with precise metrics and traces to solve tough problems quickly. Get started quickly with auto instrumentation and monitor the performance of your applications across many different programming languages. 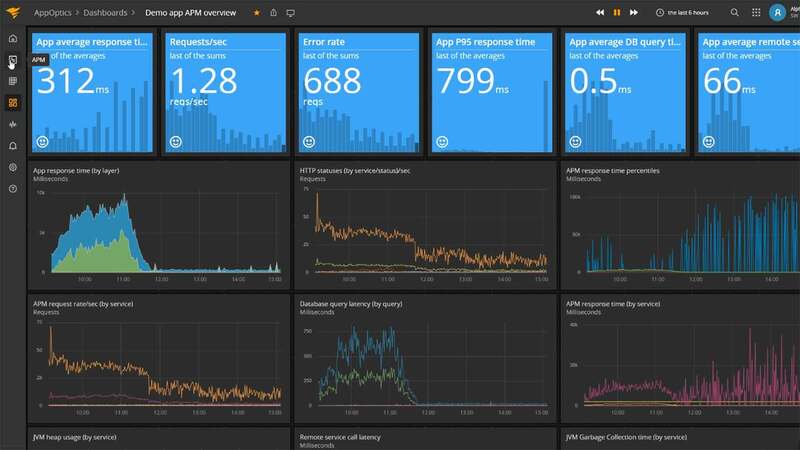 AppOptics removes the wall between APM and infrastructure metrics, allowing combined dashboards and application performance alerting.